A live-action adaptation of Maurice Sendak's classic children's tale, Where the Wild Things Are. The story follows Max, a lonely and misunderstood boy who after causing a scene over dinner, runs away to a land inhabited by ferocious wild creatures. Once there, Max confronts the wild things and soon is crowned King. Like so many others out there, Maurice Sendak's classic story has been apart of my life since childhood. I was read the story by my mother as a child and connected with Max and all of his pent up emotions. When I was little, the story meant something different to me then it did when I was a teen and later in my adult life. One thing however, has always remained constant, the mastering of feelings. Just like Sendak's original tale, Spike Jonze's film is masterpiece of mastering one's feelings. To the casual viewer, "Where the Wild Things Are" could be perceived just as a imaginative story about a bratty child, but beneath the surface, there is so much more to the thoughtful and complex story. The story and film both are narratives of a child's emotional spectrum and how one child moves through a progression of understanding these emotions. Max is a troubled and lonely boy who, up front, is dealing with abandonment issues. He watches as his sister transitions into teens, ultimately leaving him to his own devices. His father, no longer apart of his life, only extends the feelings of his seclusion. His mother seems routinely too busy with her work or new boyfriend to take any notice of his neglected emotions. The combination of these factors leads to Max's outbursts, rage and/or wild side. It is the wild side that allows Max to liberate himself in imagination. It is in his own imagination however, that Max realizes parental love is stronger than his rage. What made Sendak's tale such a classic, was his ability to tell a story that was ultimately very simple but at the same time intricate and complex. What Spike Jonze and David Eggers have done is to take those simple themes and complex emotions and expand them into one masterful 94 minute film. "Where the Wild Things Are" is a masterpiece from start to finish. The movie is incredibly honest and a stark look into the emotional spectrum of a secluded young boy. Max Records fully embodies the character of Max in "Where the Wild Things Are." Not only does Records nail his performance in every way but, he also takes the viewer along his imaginative adventure while coping with his own emotions. The range of emotions Max is expected to deliver in the role are vast, however he portrays them all without a hint of error. Max Records in "Where the Wild Things Are" will make you laugh, he will make you cry and most of all, he will have your heart awestruck throughout the entire film. Before mentioning any of the talented actors who voice the wild things, some praise must be given to the outstanding job done by the special effects department, namely Jim Henson's Creature Shop. These guys did a amazing job on the look of the wild things. Absolutely flawless. I loved the fact that the wild things were not just CGI characters, but instead actual actors in suits. Granted all of the visual effects were later added to the faces, but having actors walking around interacting with Max Records made a huge difference. Furthermore, it gave the film a far more believable appeal. The visual effects and makeup departments also deserve a ton of credit for all of the finishing touches they put on the wild things to make them look so realistic. The imagery created in the wild things is utterly stunning and had me openmouthed the entire time. Every single voice actor used in "Where the Wild Things Are" is sensational. James Gandolfini highlight's the talented group of voice actors as Carol. A wild thing that Max first connects with on the island and a creature who mirrors many of Max's same emotions. Chris Cooper voices Douglas, Forest Whitaker voices Ira and Michael Berry Jr. voices The Bull, all of whom make up the supporting cast of the wild things. Each of them have a defined role in the group, while also helping to show Max the same emotions he is coping with. Catherine O'Hara voices Judith, who is the meanest of the group to Max. Judith's scenes with Max help him to see how anger effects other people. Paul Dano provides some of the most somber scenes in the film as Alexander. Alexander is the runt of the wild things and never feels he is listened to. Finally Lauren Ambrose voices KW, a character that could be perceived in a few different ways. She very much is the mother figure to Max, but also seems to represent Max's sister who has grown apart from her younger brother. The wild things are able to come to life in new ways thanks to the emotional script penned by David Eggers and Spike Jonze. Eggers and Jonze gave new life to each of the wild things creating rich and symbolic characters that helped Max through his emotions. Each of the wild things mirrored one of Max's ranging emotions and watching as Max learns from each of the characters is inspiring. Some parents may deem that the level of emotion is too adult for younger audiences, however I took my children ages 5, 7 and 11 and they each took something away from the film. I found that the honest and realistic approach to child behavior in "Where the Wild Things Are" is staggering. As a parent I was pleased that Spike Jonze was able to make a kid friendly film that gave parents the ability to speak with their children about their own emotions and dealing with them. Furthermore, I it found very refreshing that Spike Jonze took a chance with Maurice Sendak's classic tale making an emotional and touching film instead of slapstick kiddie comedy. There are too many classic stories that have already been made in this vein and it was a nice change of pace to see Jonze go out on a limb. One aspect that helped to make "Where the Wild Things Are" a completely immersing endeavor was the soundtrack and score by Carter Burwell and Karen Orzolek (or more commonly known as Karen O of the Yeah Yeah Yeahs). From start to finish the music throughout the film is alluring and takes you away into the imaginative and emotional story. Karen O's original songs capture every angle to Max's progression in the story, while also helping to inspire a wide variety of touching emotions. It would be a complete understatement to say that "Where the Wild Things Are" would be an entirely different film minus Karen O's musical talents. 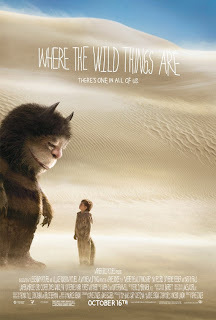 Overall "Where the Wild Things Are" was the best movie I've seen this year. A lot of that is tied directly to how much I love Maurice Sendak's original story, but what made it epic, was Spike Jonze's masterful storytelling and direction. Jonze took Sendak's original 10 sentence children's book and made it into an emotional journey that hammers home the same message as the book. If his "Where the Wild Things Are" was a baseball game, Jonze just hit a grand slam. Whether or not you are a fan of the original story, Spike Jonze' "Where the Wild Things Are" is not to be missed this year.